dealhunters949 has no other items for sale. The Pokemon GO Plus bracelet connects via Bluetooth to the phone, setting off light and vibration alerts when passing Pokestops or encountering wild Pokemon. A simple press of the button spins the Pokestop or throws a Pokeball without the need to get the phone out, the bracelet afterwards confirming a successful catch with a light signal. This was a bootleg pirated device. It is not a genuine Nintendo device. Very fast shipping, however the item was NOT authentic Nintendo go + bracelet. Product augments the Pokemon experience by being lightweight and easy to use. 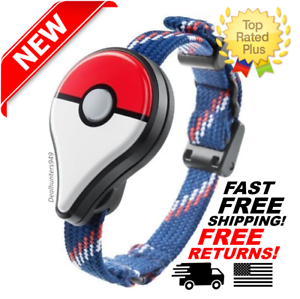 The Pokemon go battery is long lasting and the device itself can easily be affixed to clothing with the standard clip or worn with the wristband attachment also included. The device is small and manageable allowing the parent device it shares connection to maintain it's battery life. Pros 1. Significantly increases battery life as you can lock the phone and put it in your pocket 2. Even if you don't lock the phone, if you have the screen brightness set to auto, it will dim in your pocket and brighten when you take it out also increasing battery time 3. Because you just have to have the Plus in your hand, you can be looking around rather than down which defintely helps your neck. Cons 1. If you have multiple accounts on your phone you want to swap accounts and then log out of Pokemon Go and then back in before trying to sync. For some reason if you don't the sync feature seems to not find the Plus. I got this device for myself & my son. My husband hates when we play pokemon Go & this device is perfect! It's better than I anticipated! I can secretly catch pokemon or pokestops without having to pull out my phone. It also keeps up with your movement for hatching eggs. I would highly recommend for any Pokémon Go fan! I found out for one it is now hard to get an actual Nintendo pokemon go plus. I called around first to find out that most now are an unbranded one. So super excited to find an original Found out it does track steps, but also it is really good at catching pokemon so good that I ran out of balls twice. My main reason was for when I am driving and passing by a poke stop that I can actually get the spin because unless your actually stopped or going 10mph you wont get that sound in. And it works great as long as your cell service is good. I was hesitant on this purchase for a while. However, this device is amazing. The colors and vibration patterns allow you to easily recognize if you're near a Pokémon or a Poke stop. And if you collect a stop or catch/fail the Pokémon. And you can all do this while the app is minimized, so it saves a lot of battery. The app uses default Pokeball but will run through your next in line should you run out. The PoGO+ also continued to count my steps towards eggs and my buddy Pokémon while the app was minimized. So that is a nice feature. From what I can tell you only have one shot at catching the Pokémon and if you don't catch it, it flees. If you have the app open while using the PoGO+ you can navigate menus while still using the + to catch Pokémon. Not particularly amazing but pretty neat. The accessory comes with a wrist strap or it can be clipped to a shirt, lanyard, belt loop, etc. I couldn't feel the vibration at all while clipped on to my belt but I felt it when worn on my sweater that was over an undershirt more often than not. Overall I felt that wearing on the wrist with the strap was the best way to go. I am definitely happy with this purchase and highly recommend it to anyone who plays the game consistently.